Cells require lipids for the production of signaling molecules, membrane components, and as sources of fuel. Given their utmost necessity for proper cellular function, it is not surprising that defects in lipid metabolism underlie a number of human diseases, including obesity, diabetes, and atherosclerosis. In 2007-08, one-third of US adults and >18% of children (ages 6-19) were classified as obese, with obesity and type 2 diabetes on the rise worldwide. The globalization of the high-fat Western diet and the concurrent rise in the incidence of lipid disorders has provided an impetus to better understand lipid metabolism in the context of metabolic dysfunction. This need to investigate the role of lipids in metabolic disease has also brought into focus questions that remain unanswered in the field. For instance, although the genes involved in cholesterol and fatty acid (FA) uptake in intestinal cells have been identified, their exact mechanisms of action are highly debated or largely unknown. Such gaps in our understanding of these genes and how they function hinders the development of effective therapeutics for lipid disorders and reveals a need to create better approaches to address them. In general, the goal of the Farber lab is to better understand the cell and molecular biology of lipids within digestive organs by exploiting the many unique attributes of the zebrafish larvae. While the zebrafish has been established as a powerful model for the study of early development, few researchers have taken advantage of the accessibility and optical clarity of the embryos and larvae to visualize lipid uptake and processing in vivo. Specifically, the laboratory has focused on studying lipid modifying and transport processes in the developing 6 day old zebrafish larvae. The uptake and efflux of sterol is tightly regulated at the cellular and organismal level by multiple mechanisms. While it is well established that the intestine is the primary site of dietary cholesterol absorption, the mechanisms involved in the vectorial transport of cholesterol across the intestinal epithelium are poorly understood. A better understanding of these mechanisms of sterol transport may have direct translational impact on developing treatment strategies for addressing diet-induced obesity, diabetes and cardiovascular disease. We have developed an approach using larval zebrafish to visualize lipid uptake and processing in live intestinal enterocytes at the subcellular level. We developed a high-fat diet and used fluorescent lipids to track lipid processing within the absorptive cells of the intestine. We found that different dietary lipids sorted into distinct compartments; lipid droplets for fatty acids and endosomes for cholesterol. These data clearly implicate endosomal trafficking as a key component of dietary cholesterol uptake, something only suggested by cultured cell studies. Following a high lipid meal, larval metabolic function can be assessed by tracking BODIPY-labeled fatty acids as they accumulate throughout numerous organs and tissues, including intestinal enterocytes and liver hepatocytes. The Farber lab has developed techniques to visualize these fatty acids in real time using confocal microscopy. The importance of this approach is that these larvae are live and we are imaging sub-cellular structures within a living organ in the presence of bile, mucus, and symbiotic organisms. While a major function of enterocytes is to absorb dietary lipids, little data exists about the subcellular trafficking kinetics of fatty acids in live animals. Our confocal microscopy studies indicate that feeding larvae a lipid-rich meal containing BODIPY-fatty acids can be a powerful tool to study fatty acid metabolism. A live zebrafish intestine after swallowing of an endosomal dye revealing the brush boarder, goblet cells, and enterocytes. Genetic analysis in zebrafish is a powerful tool for identifying genes that direct vertebrate development. Screening methods that employ fluorescent lipids as optical biosensors of specific biochemical processes can identify mutations that perturb lipid metabolism. By applying these reagents to mutagenized zebrafish larvae, we have identified a number of mutants. One mutant, fat-free, whose digestive system appears morphologically normal yet has impaired digestive lipid processing is the focus of our most intensive efforts (Science, 2001, 292:1385-1388). We eventually succeeded in the positional cloning of the fat-free locus to find that it encodes a hypothetical protein that has no known function. New data indicates that the fat-free protein is involved in the endoplasmic reticulum - Golgi trafficking. The vertebrate genome contains a predicted 30,000 genes many of which with unknown function. The recent development of a variety of gene knockdown technologies in zebrafish has opened the door to the genome-wide assignment of function based on the publicly available genome sequence of this model vertebrate. This effort explores the molecular mechanisms that control fundamental vertebrate embryonic processes of patterning and organ formation, biological problems in which cell-cell communication is critical during development, and digestive physiology. My lab is part of a multi-center consortium to systematically assign the biological function to a set of 100-200 putative secreted proteins by a variety of targeted approaches. 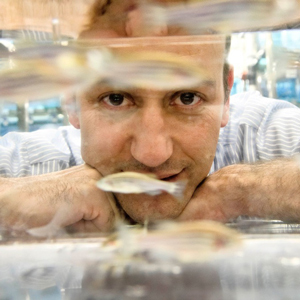 Together with Dr. Jamie Shuda, I have created a Science Outreach Program, Project BioEYES, that incorporates life science and laboratory education using zebrafish. The outreach program has two main components: educating students and community members through hands-on tours of a Zebrafish Facility, and bringing the zebrafish to 4-12th grade classrooms for hands-on experiments. The program teaches students about science literacy, genetics, the experimental process and the cardiovascular system through the use of live zebrafish. Individuals interested in postdoctoral study at the nexus of lipid cell biology, metabolism and digestive physiology, all within the larval zebrafish, are encouraged to contact Dr. Farber. Carten J.D., Bradford M.K. and Farber S.A. (2011). Visualizing digestive organ morphology and function using differential fatty acid metabolism in live zebrafish. Dev Biol. 360(2):276-85. Zeituni E.M.and Farber SA, (2012) We see the light: chemical-genetic protein regulation. Chem. Biol. 19(3):311-312. Ottis J.P. and Farber S.A. (2012) Imaging vertebrate digestive function and lipid metabolism in vivo. Drug Discovery Today: Disease Models (in press). Semova I, Carten J.D., Stombaugh J., Mackey L.C., Knight R., Farber S.A. and Rawls J.F. (2012). Microbiota and diet regulate fatty acid absorption in the zebrafish intestine. Cell Host and Microbe 12(3):277-288. Sadler K.C, Rawls J.F. and Farber S.A. (2013) Getting the inside tract: new frontiers in zebrafish digestive system biology. Zebrafish 10(2):129-31. Miyares R.L., Stein C., Renisch B., Anderson J.L., Hammerschmidt M. and Farber S.A.(2013).Long-Chain Acyl CoA Synthetase 4A regulates Smad activity and dorsoventral patterning in the zebrafish embryo. Dev. Cell. 27:635-47. Miyares R.L., Bortolo de Rezende V. and Farber S.A.(2014). Zebrafish yolk lipid processing: a tractable tool for the study of vertebrate lipid transport and metabolism. Disease Models & Mechanisms. 7:915-27. Otis J.P., Zeituni E.M., Thierer J.H., Anderson J.L., Brown A.C., Boehm E.D., Cerchione D.M., Ceasrine A.M., Avraham-Davidi I., Tempelhof H., Yaniv K. and Farber S.A. (2015). Zebrafish as a model for apolipoprotein biology: comprehensive expression analysis and a role for ApoA-IV in regulating food intake. Disease Models & Mechanisms. 8:295-309. Otis J.P. and Farber S.A. (2016) High-fat feeding paradigm for larval zebrafish: Feeding, live imaging, and quantification of food intake. J Vis Exp. Oct 27(116). Shuda J.R., Butler V.G., Vary R. and Farber S.A. (2016) Project BioEYES: Accessible student-driven Science for K-12 Students and Teachers. PLoS Biol. 14(11):e2000520. Zeituni E.M., Wilson M.H., Zheng X., Iglesias P.A., Sepanski M.A., Siddiqi M.A., Anderson J.L., Zheng Y. and Farber S.A. (2016) Endoplasmic reticulum lipid flux influences enterocyte nuclear morphology and lipid-dependent transcriptional responses. J Biol Chem. 291(45):23804-23816. Visit Google Scholar for all of Dr. Farber's publications.